When I confessed that my favorite birthday present this year was the Kindle my aunt bought for me, a friend of mine asked me “Why do you hate books, Melissa?” but the reality is that I’m spending MORE money on reading material since having the Kindle than I did when I bought only paper books. I mean, we all have either iPhones or ipods, as well, and no one asks, “Why do you hate CDs?” In truth, I still buy paper books, so I can read them in the bathtub. 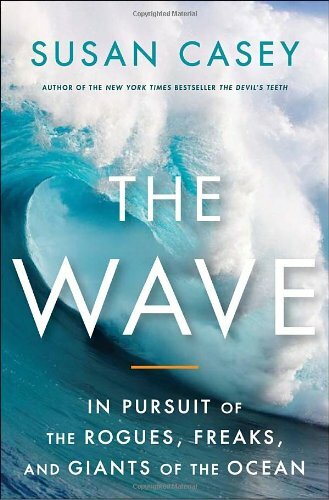 In any case, my teaser this week comes from the very beginning of my current read, The Wave: In Pursuit of the Rogues, Freaks, and Giants of the Ocean, by Susan Casey. As it’s a Kindle book, I can’t tell you the page number, but it’s from location 45-50. The clock read midnight when the hundred-foot wave hit the ship, rising from the North Atlantic out of the darkness. Among the ocean’s terrors a wave this size was the most feared and the least understood, more myth than reality – or so people had thought. This giant was certainly real. As the RRS Discovery plunged down into the wave’s deep trough, it heeled twenty-eight degrees to port, rolled thirty degrees back to starboard, then recovered to face the incoming seas. Teaser Tuesdays: The Wave: In Pursuit of the Rogues, Freaks, and Giants of the Ocean by Melissa Bartell is licensed under a Creative Commons Attribution-NonCommercial-ShareAlike 4.0 International License. ← The 12 Books of Christmas?